The trailer for Prometheus, director Ridley Scott's epic return to science fiction and the Alien universe in particular, is set to debut later tonight. But we got an early sneak peek at WonderCon, and here's our spoiler-y report! The trailer begins with a shot of waterfalls on an alien world, while Charlize Theron's corporate character Meredith Vickers observes in voiceover: "A king has his reign. And then he dies. It's inevitable." The starship Prometheus lands on the planet as its crew emerges from Alien-style cryogenic sleep. The crew includes archaeologists who are there to examine a number of ancient alien civilizations discovered throughout the planet. Logan Marshall-Green's character Holloway notes that, though the civilizations are separated by centuries, they all feature the same exact pictogram. His colleague and love interest, Noomi Rapace's archaeologist Elizabeth Shaw thinks something on the planets wants the humans to come find it. They find a map in one of the caves, but Shaw says it isn't a map: it's actually an invitation But as another crewmember wonders, it's an invitation from who? 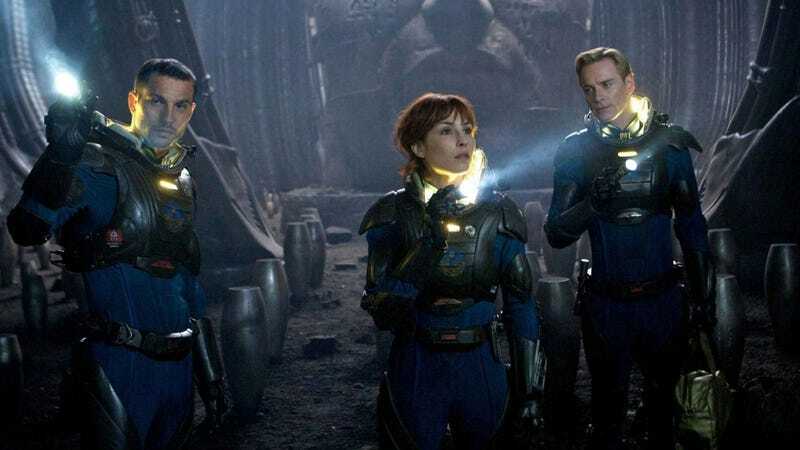 As they examine the catacombs of one of the lost alien civilizations, Idris Elba's starship captain Janek says they have suddenly detected a lifeform. And then, basically, all hell breaks loose. Elizabeth Shaw mournfully observes, "We were so, so wrong", and the trailer ends on a massive montage of chaos and carnage from forces still unknown. People are attacked, entire landmasses start pulling themselves apart, the starship tries to leave the planet but runs into resistance, there's a mishap in the cryo-chamber, and there are a couple brief shot of Noomi Rapace in underwear that is a clear visual shout-out to Sigourney Weaver at the end of Alien. I think there was also a very brief shot of one of the Space Jockeys. All the while, Michael Fassbender's android character David is experimenting with a strange goo that is apparently the recovered lifeform from this planet. At the very end of the trailer, he looks upon a bit of goo on the end of his finger and coldly observes, "Big things have small beginnings." Altogether, the trailer looked epic, with tons of striking imagery, big questions, and huge action set-pieces. It'll be a tall order for Prometheus to live up to all the hype, but things are looking good so far. The following panel featured director Ridley Scott, writer Damon Lindelof, and stars Charlize Theron and Michael Fassbender. Scott and Lindelof started by tackling the big ongoing question about this movie - what exactly is its relationship to Alien? Scott said the common explanation that it features "the DNA of Alien" is a good description, but that as he and Lindelof worked on the story it evolved into a whole other universe. Scott said there may well be a sequel, and that this movie leaves you with some big open questions to ponder. Some of the more concrete information came regarding Michael Fassbender's android David. Lindelof mentioned that David is a robot pretending to be human, though it wasn't made clear whether this referred to his human-like appearance or if the rest of the crew actually is meant to think he's human, much like Ian Holm's in Alien. Watch the "Birth of David" viral video here. When asked what it was like to play a robot attempting to seem human, Fassbender explained that he wanted to see how the character's personality might evolve in response to interaction with humans, and how he might start to develop more of a unique personality. He also said that he based David's movement on, of all people, Olympic diver Greg Louganis. Fassbender said the way Louganis approached the end of the diving board showed an economy of movement, with not a single step or muscle wasted, and he wanted to give David that same type of motion. The full Prometheus trailer should be online tonight. The movie is due to be released June 8.